﻿ The Olmec, answers to who they were and why did they disappeared? 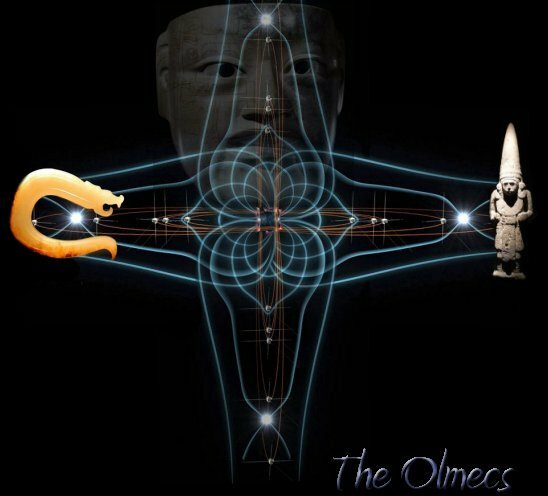 Where did the Olmecs come from? 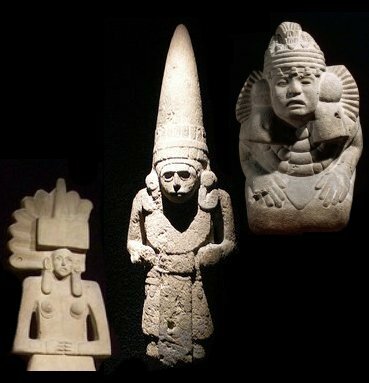 For the last few months I have been researching (through shamanic techniques) the Olmecs. 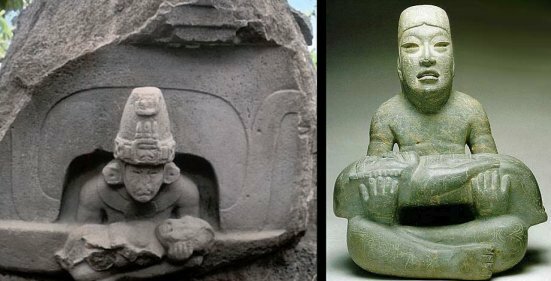 At the end of this search I’m left with no doubt that the Olmecs were a dual cultural creation between the “Originals” (see Original on this web page) and refugees form the Shang Dynasty*. The Olmec story starts with the collapse of the Shang Dynasty and a group of people that fled from the destruction of that culture. From what I have been told, (from the other side) is that this group did not have much time to prepare and kept their focus on food, water, and basic provisions. During my session I got the impression that the individuals involved in this escape were a group composed mainly of intellectuals, aristocrats and shamans. They had become a liability to the new conquering nation. History does show that there was a focused attempt to eradicate all knowledge of the Shang Dynasty, so it makes sense that the “keepers” of this culture would have to be destroyed also. I'm not sure if they understood were they were fleeing too but it feels like there was no other choice but to get out of Asia and to somewhere far out of reach. From what I was shown, they made their final destination the shores of southern Mexico at the mouth of a river (did not ask what river). Shortly after landing they scuttled the larger boat and continued with smaller ones. They realized that staying close to a river would be their best chance of surviving. Unfortunately their ability to live off the land was not part of their expertise and they soon found themselves in need of food. They traded what they had with small groups of locals and continued to look for a larger urban area were they could exchange their knowledge with others that would recognize their skills. Half starving and on their “last leg” they finally made contact with a larger urban center were they were taken in. The end of their journey came with the acceptance and curiosity of an already established urban center, somewhere around La Venta, Tabasco. Helped back to health, the cultural exchanges started. The legends of this first meeting were immortalized in sculptured stone reliefs, as shown below. Within this first contact sprang two separate perceptional accounts, one from the survivor’s side and the other from the “Originals” that welcomed them into their culture. Pictures above - show the Original’s version of saving these smaller humans from death. 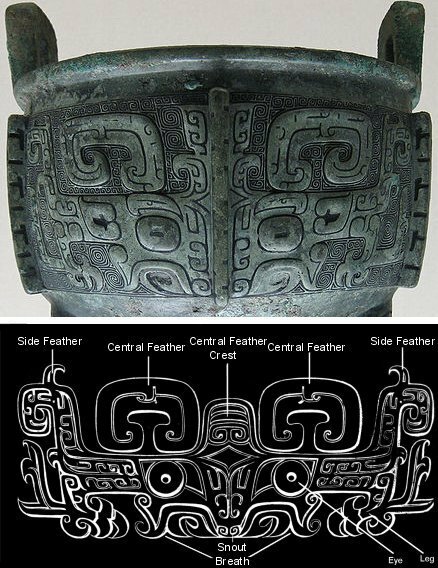 The photo to the left (carved 350 years after first contact) is an imagery-symbol of the Shang’s first appearance representing an offering of themselves and need they had. This is represented as the gift of their “infantile state” , their survival skills (shown as a child). Sculpture on the right was created 500 years after first contact and has been simplified to just the main elements. They came with great power emerging from the “cave” mouth of the dragon (of the Dragon Jinn level) but were helpless in survival levels without the Original’s help. Because of this survival styled introduction to the new world there were few material items or artifacts that made it. Their contribution to the original people would be through the knowledge they possessed. This knowledge was a huge contributor to an already stylized cultural centre and was to become an influence in future cultures following the Olmec. 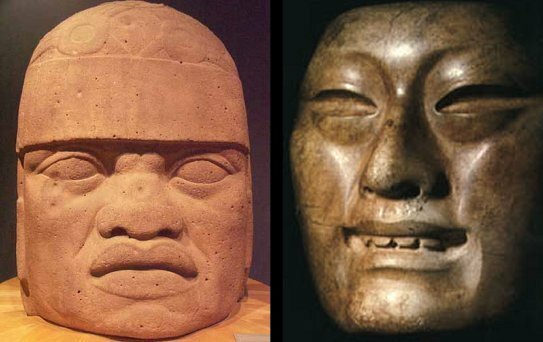 From what I have been shown the large head sculptures (shown below) are those from the pre-existing culture, as compared to the newcomers profile on the right. 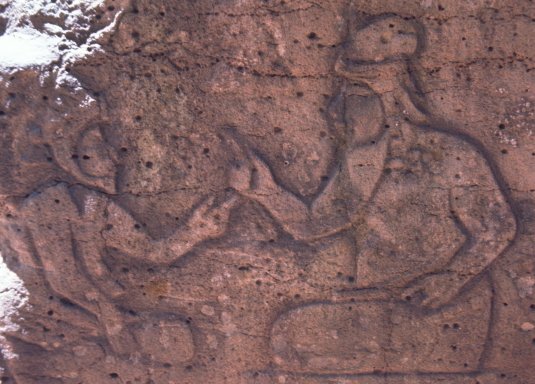 The sculpture shown below is from the Shang side and shows the Dragon energy (Jinn aspect of this culture) with a member of this first contact. He is wearing a Shang helmet with a chin guard and a symbolic “gift of knowledge” in his hand. The Dragon, a Jinn aspect, represents the Power of Creating in the Physical. The Shang’s perception of first contact. The Shang come bearing gifts through the power of the dragon energy (shaman totem). Notice the feather on the top of the dragon’s head. This was the birth of the Feathered Serpent concept. In the picture above I was told that this stone relief symbolises the Originals offering food to the Shang (on left still wearing a helmet). The Shang in turn points to the hand that feeds them. Pictures below are examples of ancient Chinese helmets. 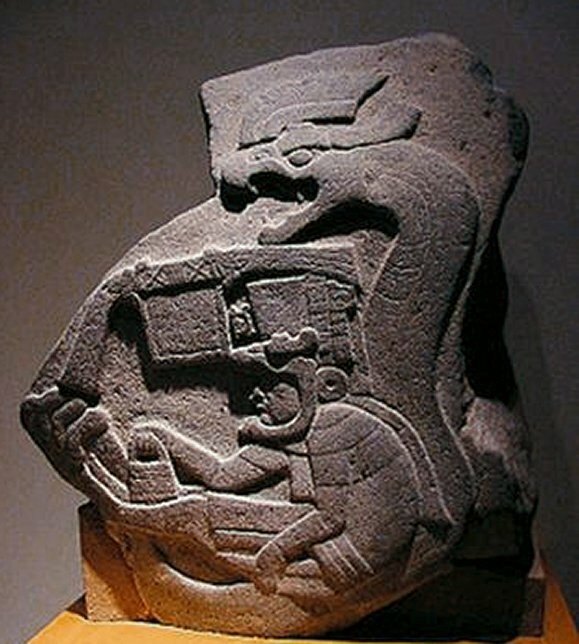 The Original’s old version seen in the transference of culture, with the Dragon in the rock and human form emerging from its mouth. The dragon’s mouth would eventually be the caves of future cultures like the Maya. I was also told that the original Asian dragon images had three feathers that made up a tri crown. Many years later these feathers were turned into horns, to add fearsome imagery to the dragon. The “Dragon” level of creation originates in nonphysical levels not much different than other contacts that shamans can access. Examples of this are the lower world totem animals or the higher vibrational world of the angels. The higher states of being at any level can be very advantages to a shaman. The ancient Chinese understood this and used the dragon contact level of power to create their cultures. This level can be accessed through angles that are closer associated to the 90 degree direction of the Earth Orb. This is the physical energy flow of all physical realities. Going higher or lower will produce contacts but they are less physically orientated (having less ability to effect in the physical) like angels or animal guides. This connection was the main gift brought over to the Central American “Originals” and was quickly recognized and accepted. In Central America prior cultures used the Jaguar of the lower world (120 degree connection) as their contact for knowledge. The Dragon connection is closer to the 90 degrees (of the Earth Orb) and is more physically powerful, so the introduction breathed new life into a stagnant culture. This new breath was a powerful creative force that launched the advancement of new understandings for this area. This was not any different than how the Chinese’s ignited the Renaissance in Europe (see Gavin Menzies book “1434”). Yes history needs to be rewritten! The Dragon can be seen in the rock’s mantel (in the pictures above) with its mouth represented as a cave. 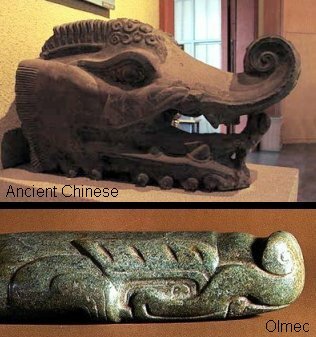 This cave origin aspect was later adopted by the Mayan along with other Shang elements like the curled “nose” motifs seen in Mayan and Shang art to its (picture below). Olmec ceramic with curled nose on the left - ancient Chinese jade to the right. The dragon became even more stylized as preceding cultures like the Mayan and Aztec came on board. The Tree of Life seen in the picture below shows the dragon at the bottom still displaying its stylized feather. In this image you can see the dragon’s eyes, mouth, and feathers on top. I was told that in preceding Chinese cultures the feather eventually evolved into wings. I was also informed that horns were added by non-shamanic groups that wanted to make them more fearsome. The three feathers of a dragon's crest. This stela was first discovered in 1941 in Izapa, Chiapas, Mexico and is another representation of the origins of the Olmec culture. The Olmec culture (Shang gifts) had a great influence in the region and this stela is their bible's Eden story. 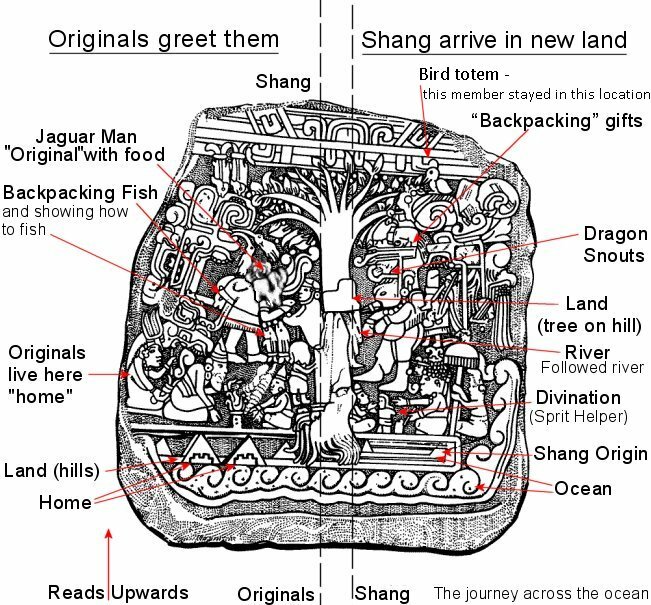 I was shown by the other side that the stela shows the meeting of two worlds, the Shang on the right and the Originals on the left separated by a landmass of fist contact. Below is the dissection of what I was shown. 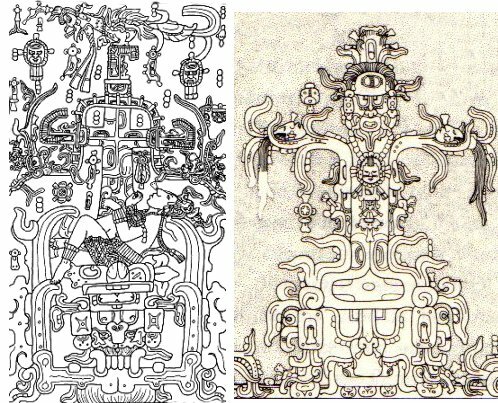 I was told that the scene on the right bottom side of the tree depicts the beginning of a shamanic contact between the Shang Shamans and the Original Mexican shamans. The small figure between them represents a spiritual form of “contactee” or communicator for the two groups. This was prior to any sailing or desperate flight from China and is the reason why it is placed at the bottom right. The stela reads from bottom to top “in time frame” and is divided in to the two stories separated by the tree on top of the land mass of first contact or landing. I was also told because of the ocean origin the dragon became associated with water (Mayan iconolatry) from this ancient legend. *I cannot say for certain if this is the exact name of the culture all I know is it was around that time period. I did not investigate any further.